With these easy key turners, turning small keys takes less strain. Plastic key covers snap easily over standard keys. 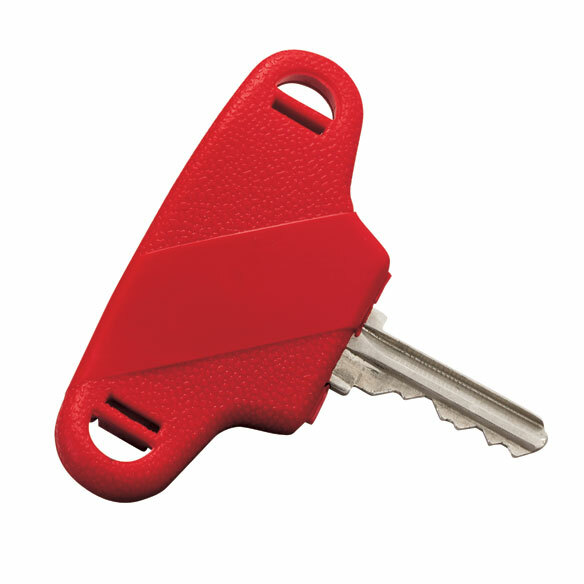 Easy key turners set of 2 comes in assorted colors. easy to use to use. I love it, I can finally hold on to the key without fumbling. I AM A SENIOR WITH NEUROPATHY IN MY RIGHT HAND MAKING IT DIFFICULT SOMETIMES IMPOSSIBLE TO TURN KEYS. THIS ITEM GAVE ME THE EXTRA LEVERAGE I NEEDED TO HANDLE THIS EVERYDAY TASK. HURRAH!!! My wife has a hard time with her hands turning the house key. This product saved her hands. It should be standard equipment for all people with hand issues. Makes house keys easier to turn. I use this for my back door key. We have a deadbolt lock that has to be unlocked from the inside. When at home, we keep a key in the lock. This key turner has made it so easy to turn the key to lock or unlock -- I'm tickled with it every time I use it. It is large enough that enough the stiffest hand can manage it. Really helps arthritis hands (at least in early stages) to turn a key without pain but can't fit on a key ring witch is the only downfall I find with it. fits Standard Keys - not my car one! I should have paid attention to the "standard keys" info. The key turner doesn't fit on top of some of the newer car keys, but works nicely for standard keys. This is something every driver can use. My mom has severe rheumatoid arthritis and I purchased this item at her request. She is now able to unlock her door with greater ease than before. If the key doesn't have a ROUND hole at the top, you can't get it on the key. There is a little piece that the hole in the key is supposed to fit on to but if the hole is square, like my key is, it doesn't work. Key would have to be loose so far as I could tell. If made with slip over soft plastic it might be useful. I have ONE key that I used it with after one use it falls apart, also the key slips out when it is in my purse. Of no practical use with my neuropaty, and arthritic hands. I will not try this again. I bought 2 sets of 2 and none of them fit over my keys. My friend had torn ligaments in her thumbs. Just wanted to make things a little easier for her. To easily find my house key in the dark. I will be able to see my KEY better ,in my bag ND MY CAR. For Mom with arthritic fingers. Giving to someone who has trouble turning a key due to weakness in her hands. My hands don't always work so good. There is no way that these hands will let me unlock the deadbolt for the back door. This looks like it's something that will do the job for me. My elderly aunt couldn't turn the key to open her door due to arthritic fingers. To help turn car key. Ease for the aging fingers for 2 of the keys most frequently used. the head on my house key is too small. Keys to 1972 Chevelle turn so hard so I ordered these. I have one of these already for my front door and I like it so well I'm getting one for the back door as well. To make unlocking my car door easier for arthritic hands! have several small keys for personal as well as work use. in the winter cannot turn key unless I remove my gloves. My husband has Parkinson's and this should help him with entry problems. To tell the difference between keys. I have difficulty holding and turning my key in a lock due to neuropathy in my hands. I have RSD rt. hand and limited use of fingers. Love this!!! Hands don't hurt to unlock door. Turning the key is so easy! Wouldn't be without it now!!! what other colors of the key turner ? BEST ANSWER: Thank you for your question. The colors are red/blue, blue/yellow and yellow/red and we are unable to select colors they are chosen when the package is sent out. We hope this information will be of help to you. Will this work on a car key too? I have a nissan and this would be perfect, just not sure if it would fit the end of the key. BEST ANSWER: Thank you for your question. No, it would not fit onto a car key. We hope this information will be of help to you. Need to change out the keys - how? BEST ANSWER: The turner opens on a hinge allowing you to insert a key. After it is inserted, simply fold the two halves together and snap them securely. I could not use my door key without the turner. I have hand weakness and cannot grip the top of the key, insert into a lock, and turn it. Hope this helps.